It's your luck! 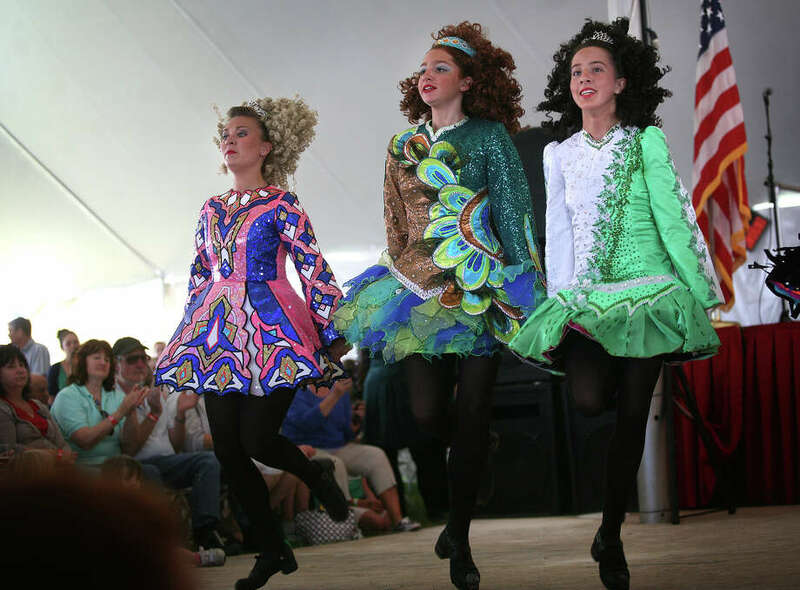 The 26th annual Fairfield County Irish Festival is Friday, Saturday, and Sunday. Find out more. Grab a baked potato and enjoy some grass roots music from Four Barrel Billy as Brookfield kicks off their Concerts in the Park series on Friday. Find out more. Musicals at Richter opens its season this weekend with “Hello, Dolly!” through Saturday, June 25, at MAR’s outdoor theater in Danbury. Find out more. "Finding Dory," the sequel to Pixar's hit movie "Finding Nemo," hits theaters on Friday. Check out the trailer. The Darien Summer Nights concert series with artist Freeflow and DJ Pacifico at Darien's Grove Street Plaza on Friday. Find out more. “The Foreigner” is on stage in Newtown this month, runs through Saturday, June 25. Find out more. Twenty One Pilots performs at Mohegan Sun Arena on Friday. Find out more. Check out Party on the Rooftop at Mohegan Sun on Friday, featuring live music from Bon Jersey, cocktails, and fire pits. Find out more. Join the Greenwich Historical Society as they host their Summer Soiree on Friday at French Farm in Greenwich. Find out more. The World Series of Fighting brings a series of MMA fights to Foxwoods Resort and Casino on Friday. Find out more. Dave Mason, a member of the Rock and Roll Hall of Fame, brings his multimedia show, “Traffic Jam,” to The Warehouse in Fairfield Theatre Company on Friday. Find out more. "Central Intelligence," starring Kevin Hart and Dwayne Johnson, opens in theaters Friday. Check out the trailer. Get dancing at the Ringmaster's Ball on Friday at the Bridgeport Holiday Inn, part of the Barnum Festival celebration of events. Find out more. Michael Urie stars in "Buyer & Cellar" at the Westport Country Playhouse through July 3. Find out more. Actor and comedian Dustin Diamond is performing at Club Comedy in Naugutuck on Friday and Saturday. Find out more. Meet and greet with Miss Connecticut 2015 Colleen Ward, of Wolcott, and Miss Connecticut 2016 contestants at Mohegan Sun's Signings & Sightings event on Friday. Find out more. Comedian Mike Hanley will do four shows at the Comix comedy club at Mohegan Sun, Thursday, Friday, and Saturday. Find out more. Cirque du Soleil brings its new arena production, “Ovo,” to the Hartford's XL Center Friday, Saturday, and Sunday. Find out more. The Dixie Chicks are performing at Hartford's Xfinity Theater on Friday. Find out more. Join the Norwalk community on Saturday as they Zumba for Peter Tinnen-Strminska, who recently died in a tragic accident. All proceeds benefit the Tinnen-Strminska family. Find out more. The Barnum Festival’s free Wing Ding parade and activities take place Saturday at Beardsley Park in Bridgeport. Find out more. Sacred Heart University, in Fairfield, will be the site for a daylong percussion fest Saturday, featuring drummers and others from the Jim Royle studios in Bridgeport. Find out more. Jen Durkin and the Business will grace the Bijou Theater stage with The Greg Sherrod Band and local School of Rock all-stars on Saturday in Bridgeport. Find out more. Shelton's Freedom Beer Fest, which brings 50 breweries together to benefit Building Homes for Heroes, is Saturday at Veteran's Park. Find out more. School of Rock bands from New Canaan, Madison, Mamaroneck, Fairfield, and Bedford, N.Y., will jam this weekend at Fairfield Theater Company on Saturday and Sunday. Find out more. The Arch Street Teen Center will play host for the Project #EveryBodyBeautiful Fashion Show, featuring students from Fairfield and Westchester, N.Y., counties, on Saturday in Greenwich. Find out more. Enjoy local food, live music, vendors, and garden tours at Summertime at St. Paul's on Saturday at St Paul's on the Green in Norwalk. Find out more. Dennis Miller and Bill O'Reilly [pictured] bring their Who Wants to be President Tour to the Mohegan Sun Arena on Saturday. Find out more. Greenwich Audubon will open its new “nature play” trail on Saturday. Find out more. Fairfield's Summer Concert Series continues on Saturday, with a summertime band performing the golden oldies at the Sherman Green Gazebo. Find out more. The Black Rock Farmers Market kicks off its third season on Saturday. Find out more. It's your last chance to catch Batman v. Superman playing at The Maritime Aquarium's IMAX theater, on Saturday and Sunday, in Norwalk. Find out more. Enjoy some delicious food at the Strawberry Festival Craft and Fine Art Show at the Monroe Congregational Church on Saturday and Sunday. Find out more. Grab your bike and hit the road for a great cause at The Ride For Our Vets charity ride in Stamford at Pont72 on Saturday. Find out more. Join the Bartlett Arboretum & Garden for their 2nd annual Rockin' the Bart rock n' roll fundraiser on Saturday. Find out more. The Stamford Jewish Community Center hosts the 7th annual JCC Kids Triathlon on Sunday. Find out more. Downtown Westport becomes a continuous art gallery during Art About Town in Westport, which ends Sunday. Find out more. Eastbound Theatre will present the third show of its 22nd season, “The Heidi Chronicles,” by Wendy Wasserstein, which ends Sunday, at the Milford Center for the Arts. Find out more. The Greenwich Polo Club's 35th season is off the a roaring start. Sunday marks the final match for the USPA Monty Waterbury Cup. Find out more. The Shelton History Center will host their Vintage Vehicle Antiques & Classic Car Show on Sunday at the center. Find out more. Charlie Puth and Nick Fradiani will host this week's Liquid Sundays pool party at Foxwoods Resort and Casino Sunday. Find out more. A Summer Solstice celebration takes place on Father’s Day, Sunday, at the Westport Library. Visitors will be able to safely look at the sun through telescopes and participate in yoga classes. Find out more. Stamford Museum and Nature Center's Farm Market has returned and runs every Sunday through October. Find out more. KISS 95-7's Summer Kick Off Concert, including acts by Charlie Puth [pictured], Mike Posner, Bebe Rehxa, Nick Fradiani, and Nelly, hits Foxwoods Resort and Casino on Sunday. Find out more. Concert on the Green returns to Redding Sunday, as Louder Daddy kicks off the concert series at Redding Town Green. Find out more. Magician Michael Carbonaro performs at Foxwoods Resort Casino on Sunday. Find out more.